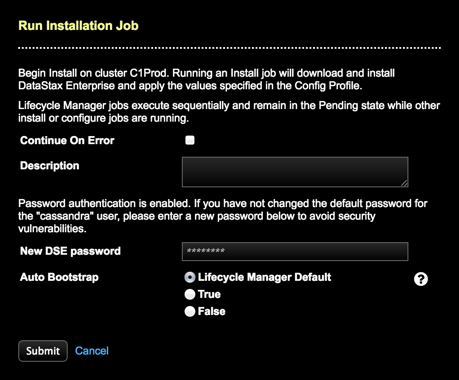 Submit a DataStax Enterprise install job to run on a cluster, datacenter, or node. An install job includes running a configuration job and by default, installing Java and the JCE Policy files required to enable unlimited strength encryption. LCM does not create data directories or manage their permissions on your behalf. If you want to use a custom data directory, please ensure that it exists and is owned by the cassandra user. Select the cluster, datacenter, or node to run an install on. The Install Job dialog appears. If LDAP authentication is configured for a DSE cluster, you are prompted to enter your LDAP Username and LDAP Password the first time an install job is run on the cluster. Providing the LDAP credentials is necessary for OpsCenter to connect to the cluster for monitoring. Select an auto_bootstrap option in cassandra.yaml. To override the LCM smart default, choose True or False as required. LCM Default: Sets the option depending on actions within the job. When adding a cluster or datacenter, sets auto_bootstrap to False. When adding nodes to an existing datacenter, sets auto_bootstrap to True.